Form OW-8-P is a Oklahoma Tax Commission form also known as the "Worksheet For Underpayment Of Estimated Tax". The latest edition of the form was released in January 1, 2017 and is available for digital filing. 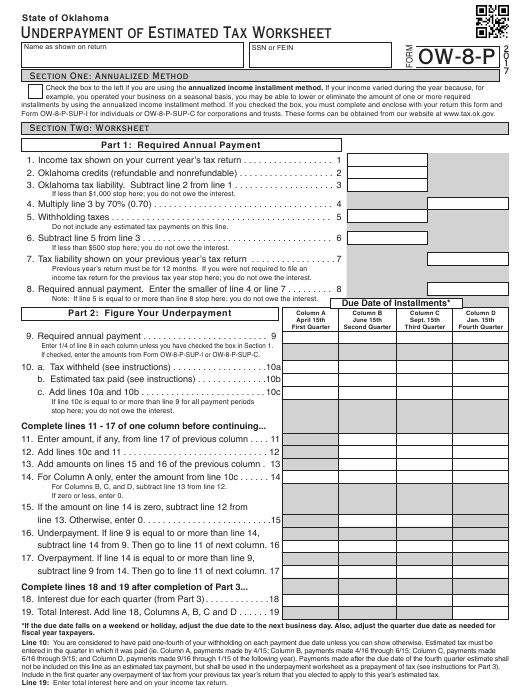 Download an up-to-date fillable Form OW-8-P in PDF-format down below or look it up on the Oklahoma Tax Commission Forms website. Form OW-8-P-SUP-I for individuals or OW-8-P-SUP-C for corporations and trusts. These forms can be obtained from our website at www.tax.ok.gov. If less than $1,000 stop here; you do not owe the interest. Do not include any estimated tax payments on this line. If less than $500 stop here; you do not owe the interest. income tax return for the previous tax year stop here; you do not owe the interest. Note: If line 5 is equal to or more than line 8 stop here; you do not owe the interest. Enter 1/4 of line 8 in each column unless you have checked the box in Section 1. If checked, enter the amounts from Form OW-8-P-SUP-I or OW-8-P-SUP-C.
stop here; you do not owe the interest. For Columns B, C, and D, subtract line 13 from line 12. If zero or less, enter 0.
not be included on this line as an estimated tax payment, but shall be used in the underpayment worksheet as a prepayment of tax (see instructions for Part 3). Include in the first quarter any overpayment of tax from your previous tax year’s return that you elected to apply to this year’s estimated tax. Line 19: Enter total interest here and on your income tax return. Complete each quarter before going to the next quarter. Enter required payment from Part 2, line 9, Column A. Enter apply from previous year, if any. Enter any estimated tax payment. Enter tax payment made after 4/15. Total interest due for first quarter. Enter required payment from Part 2, line 9, Column B. Enter any withholding not used in prior quarter. Enter any estimated tax not used in prior quarter. Enter tax payment made after 6/15. Total interest due for second quarter. Enter required payment from Part 2, line 9, Column C.
Enter any withholding not used in prior quarters. Enter any estimated tax not used in prior quarters. Enter tax payment made after 9/15. Total interest due for third quarter. Enter required payment from Part 2, line 9, Column D.
Enter tax payment made after 1/15. Total interest due for fourth quarter. proceeding to the next quarter. payment for this purpose and should be listed using the date you filed your return or the original due date, whichever is earlier. portion of a payment necessary to bring the balance due to zero. quarterly due date, that have not been applied to a previous quarter. payment separately on an attached schedule using Columns A through E.
lines, bring the required payment down to the estimated tax line in Column C and complete Columns D & E.
due from the date of this payment until the date of the next payment or the original due date, if no payment is made.